The 61st annual Grammy Awards are happening today and we’re ready to bring you all of the action live as it happens. Unlike the troubled Oscars, music’s night of nights has a host in Alicia Keys, and will feature performances from the likes of Miley Cyrus, Shawn Mendes, Janelle Monáe, Post Malone and the Red Hot Chili Peppers. Music legend Diana Ross will also take to the stage to celebrate her 75th birthday and tremendous contributions to the industry. Someone who will be absent from the Grammys stage is Ariana Grande, who was unable to see eye-to-eye with event producers about her performance. Kendrick Lamar leads the nominations with eight, while Drake follows closely with seven. 3:45pm: No one is more surprised than Kacey Musgraves over her Album of the Year win for Golden Hour. The country music star is honoured and humbled over her award, saying that she still can’t believe she’s even nominated. 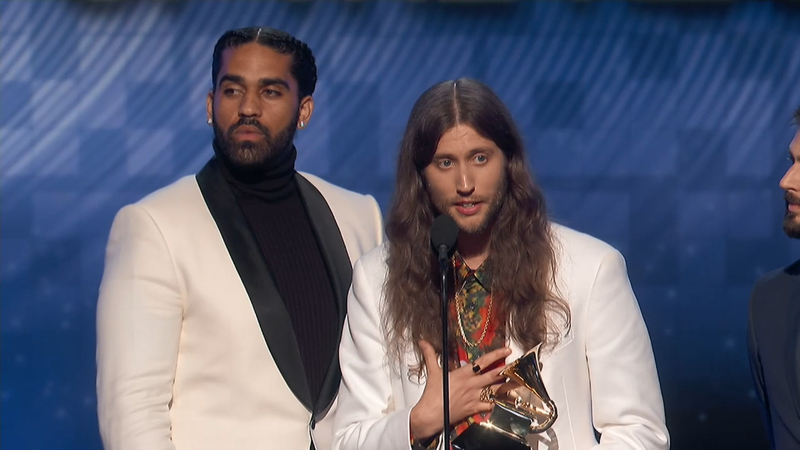 3:30pm: He just won the night’s biggest award, Record of the Year, for his song ‘This Is America’, and still producers didn’t give Childish Gambino‘s collaborators more time to deliver a speech on his behalf. 3:21: What is meant to be Dua Lipa’s moment in the spotlight is cut short. The British singer wins Best New Artist and being a newbie is not yet savvy when it comes to acceptance speeches. So slow is she getting through her speech, producers cut her short. Not only that, they even cut off her microphone altogether. It can be argued that, like Drake, Lipa shades the Grammys so naturally they didn’t let her speech continue. 3:05pm: The Best Rap Album goes to Cardi B‘s Invasion Of Privacy. She nabs the win from artists Nipsey Hussle, Pusha T, Travis Scott and Mac Miller, who received a posthumous nomination following his death last year. 2:45pm: The Best R&B Album goes to H.E.R., aka rapper Gabriella ‘Gabi’ Wilson. She beat out the likes of Toni Braxton and Leon Bridges. The American rapper is genuinely shocked at her win, although she says her self-titled album isn’t really one. “It’s an EP,” she tells the audience. 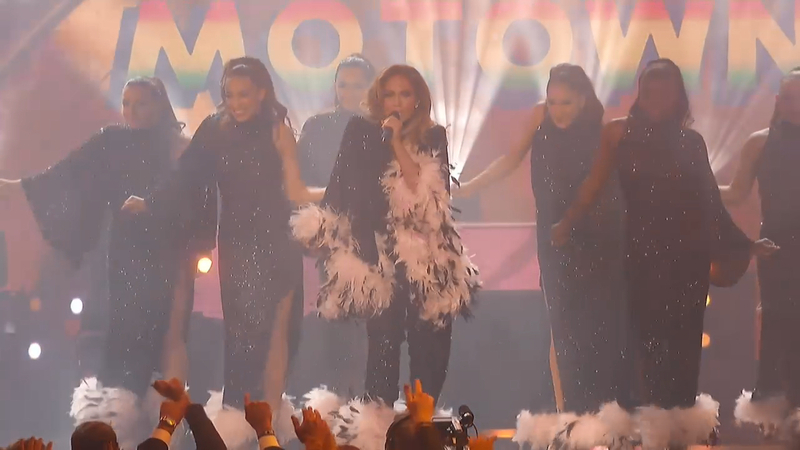 2:25pm: Triple-threat Jennifer Lopez performs a medley of songs in tribute to the Motown era, but the reviews so far aren’t favourable. Even with the legendary Smokey Robinson helping to sing hits such as ‘Dancing in the Street’ and ‘Mr Postman’, Lopez’s performance isn’t well received. As if sensing a backlash was imminent, Robinson told Variety prior to the event that there’s no reason Lopez shouldn’t lead the musical tribute. 2:10pm: The cutest presenter of the night is hands down Diana Ross‘ grandson, Raif. The 9-year-old — who is the son of her daughter, Rhonda Ross — takes to the podium to introduce his grandma, who is also celebrating her 75th birthday. As the legend emerges, the camera pans to show how much of a family affair it is for Ross, with her other children Tracee Ellis Ross and Evan Ross and his wife Ashlee Simpson looking on proudly. “It brings me joy, through my life there has always been music and its power,” says Ross before singing her song ‘Best Days Of My Life’. 2:00pm: The award for Best Rap Song goes to Drake but he’s anything but thankful to the Grammy organisers. 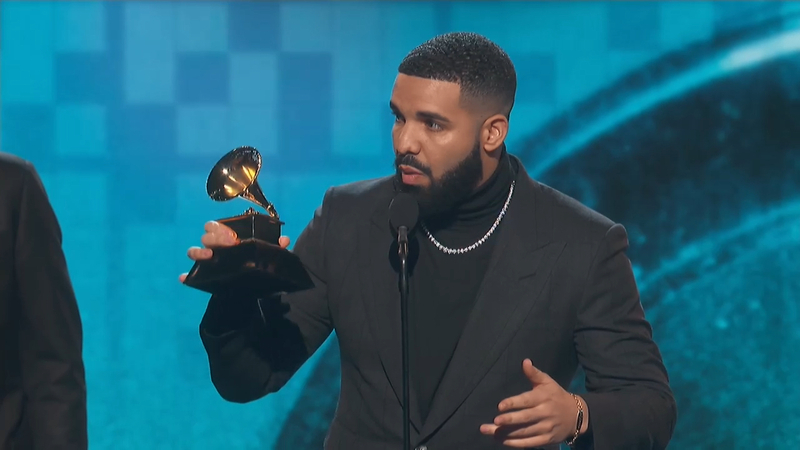 The rapper — who beat out the likes of Travis Scott and Eminem to win for his track ‘God’s Plan’ — takes a swipe at the Grammys for finally including him in the right category, while also implying that award ceremonies mean nothing because sold-out tour dates is what really matters. “We play in an opinion-based sport, not a factual-based sport,” Drake says. “The point is, you’ve already won if you have people who are singing your songs word for word, if you’re a hero in your hometown. 1:40pm: The talented Alicia Keys playing two pianos at once is everything. The singer sat herself between the instruments as she plays a medley of songs she wish she had written, including ‘Killing Me Softly’, ‘Use Somebody’, ‘Doo Wop (That Thing)’ and ‘Unforgettable’. But she also performs some of her classics, including her smash hit ‘New York’. And this is why she’s won 15 Grammys from 25 nominations. 1:20pm: Rapper Cardi B is raising eyebrows left, right and centre at the event. First, the rapper — who’s up for three Grammys — turns heads on the red carpet after packing on the PDA with her husband Offset, who she appears to have reconciled with. Cardi’s performance to ‘Money’ during the ceremony also leaves viewers thirsting for more as she takes the stage in a leopard-print catsuit — even Chrissy Teigen is left speechless. 1:00pm: The iconic Dolly Parton receives a stunning musical tribute from stars including Kacey Musgraves, Maren Morris, Little Big Town and Katy Perry. But it’s her duet with goddaughter Miley Cyrus that wows the crowd. The duo perform Parton’s 1973 hit ‘Jolene’, which Cyrus also released a cover of in 2012. The pop star’s father, Billy Ray Cyrus, says the pair have always had close connection and it remains firm to this day. 12:45pm: In case you were wondering where John Legend is, he’s at home sleeping, according to his wife Chrissy Teigen. Legend and Teigen are usually regulars at the event as he is pretty much nominated every year. But since becoming part of the coveted EGOT club last year– that is an artist who’s won an Emmy Award, Grammy Award, Oscar and Tony Award — Legend seems to be slacking a little. “No Grammys for us today. john got and EGOT and egot lazy,” Teigen tweeted along with a photo of her husband in bed napping. 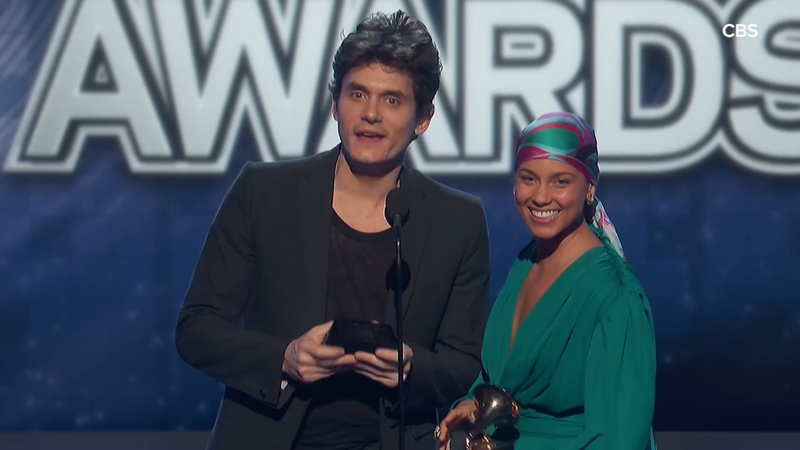 12:45pm: Alicia Keys reveals a sweet moment when John Mayer gave her part of his Grammy Award back in 2005. Apparently, her song ‘If I Ain’t Got You’ was nominated for Song of the Year, as was his hit ‘Daughters.’ But he felt that Keys should’ve taken out the gong, so he gave her half of her trophy. The pair revisit the moment on stage at this year’s ceremony. 12:10pm: Host Alicia Keys is certainly the hostess with the mostest… A-list friends, that is. 11:30am: Ricky Martin walks the red carpet with one of his twin sons, Matteo. In a rare public appearance, the 47-year-old singer and father-of-three brought the 10-year-old as his plus-one to the event. “Cool cat for a date at The Grammys!! !” Martin captioned an Instagram photo of the pair. It’s a special occasion for Martin as this year’s ceremony marks 20 years since he performed at the event for the very first time in 1999. 10:45am: Before the show even began, awards were already being given out. Lady Gaga won Best Song Written for Visual Media for the A Star Is Born ballad ‘Shallow,’ sharing the honour with co-writers Mark Ronson, Andrew Wyatt and Anthony Rossomando. Ariana Grande — who will not attend the event due to creative differences with producers — also won an Best Pop album for Sweetener — her first ever Grammy Award. “I know i’m not there tonight (trust, i tried and still truly wished it had worked out tbh) and i know i said i try not to put too much weight into these things …. but f— ……. this is wild and beautiful. thank you so much,” she tweeted. 10:00am: The daughter of late Soundgarden and Audioslave frontman, Chris Cornell, has paid tribute to her father on the Grammy Awards red carpet at the Staples Center in LA. Toni Cornell, 14, wore a T-Shirt with her dad’s image on the front as she arrived at the event with her mother Vicky and brother Christopher Jr.
7:20am: American singer Bebe Rexha told off the audience at a pre-Grammy gig after they failed to show some enthusiasm as she sang on stage. The 29-year-old was performing her hit song ‘Meant To Be’ at a Spotify’s Best New Artist Party at the Hammer Museum in LA when she noticed no one was singing along, so the pissed-off pop star snapped. “This song was No. 1 for 50 f—ing weeks,” she said, while also telling the band to stop playing. “I work too f—ing hard for this s—, OK? I worked too hard for this moment. “I’m from Staten Island, New York, and I’m standing on this stage right here. You’re going to sing the f—ing words if you know the f—ing song,” she added. 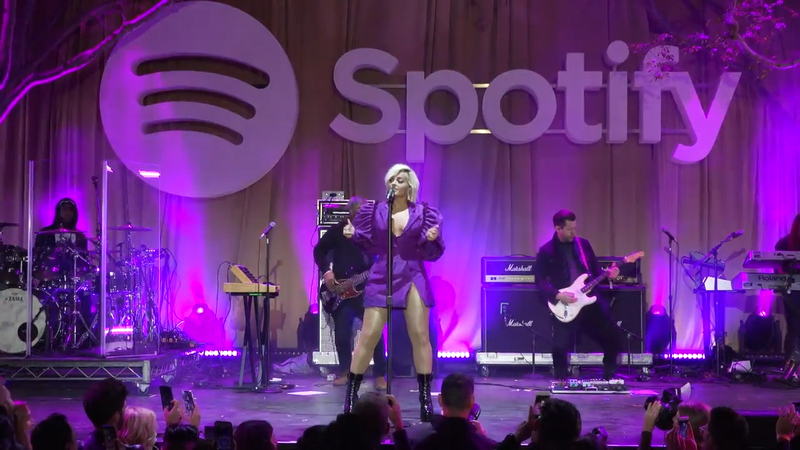 Rexha’s pep talk — which was caught on camera by The Hollywood Reporter — appeared to have worked as her second attempt at the song was greeted with more audience participation.